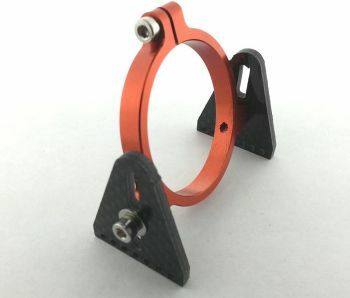 OSE Rear motor clamp with carbon fiber stands. If you have a boat with a front style motor mount and are upgrading to a longer or heavier motor, this may be what you need to support your motor. The larger upgrade motors are typically heavier than stock motors which puts a strain on the front mount, causing the mounting area to break and flex cables binding/breaking due to the motor bouncing up and down. This mount is adjustable up and down, but may need to be cut or altered to fit your particular application. We added lots of glue holes to the bottom of the carbon mount for added strength when glued into your hull. We have this for either 36mm or 40mm diameter motors.